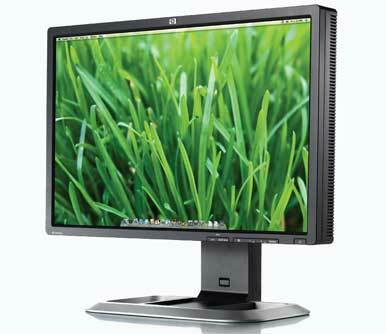 HP’s LP2475w is a feature-packed 24-inch widescreen LCD that looks great, too. This moderately priced display hits all the right buttons. One of the biggest decisions you may have to make when setting up this display is which of the myriad connectors to use. The LP2475w offers one HDMI port, one DisplayPort input, two DVI ports, Component, Composite and S-Video inputs, as well as a DVI to VGA adapter cable for older analog inputs. And you don’t have to choose just one, as the L2475w supports picture-in-picture and picture-outside-of-picture, letting you select Composite, Component or S-Video as the secondary input. The LP2475w also sports an extremely flexible design allowing you to pivot, rotate and adjust the height of the screen. The LP2475w has an anti-glare screen and a slim, dark gray bezel with clearly marked and easily accessible buttons on the front bottom right of the screen. The menu system for the built-in controls is well organized, easy to use, and offers some interesting features like setting times for the display to automatically go to sleep and the option to turn off the small green power light on the front of the screen, which I guess could annoy some folks. Once connected to our test system (a 2.66GHz Mac Pro) via DVI, the display powered up quickly and into its correct, native 1,920 by 1,200 resolution. The display boasts a 400 nit brightness and a 6ms pixel response. Unlike many displays, the LP2475w didn’t require much tweaking from its default settings, looking good right out of the box. Text was clean and fairly sharp, even at small point sizes, earning a Very Good rating. We didn’t find any dead or stuck pixels and colors looked uniform across the screen. In our standard color photo test we found colors to be bright and pleasing, if a little bit over the top in the reds. The viewing angle of the display isn’t the best we’ve seen, but not bad at all, with just a slight loss of contrast as you move your head left or right of center. You should have no problems at all, when using the display in normal day-to-day situations. With its bountiful input choices and its generous features set, the LP2475w is a great display for those looking for a monitor that can go from work to play at the push of an easy to find button. Bright, pleasing color, fast pixel response times and a flexible design make it easy to recommend the LP2475w.